A Greater Swiss Mountain Dog named Chance, rescued in Canada after being abandoned with a severe limb deformity, is walking better today, thanks to veterinarians at the University of Florida College of Veterinary Medicine who used advanced 3-D technology to operate on him in February. A pot-bellied pig named Bebop, who also received limb-corrective surgery at UF last November with 3-D printing help, is back to rooting in his yard in Port St. Lucie, Florida, which he’d stopped doing after a painful shoulder injury. Chance and Bebop are the first two clinical cases treated over the past six months at UF through the use of a state-of-the-art 3-D printer that uses high-performance plastics and offers numerous advances in patient care, teaching and research, UF veterinarians say. Among the printer’s capabilities are the ability to create bone models with which veterinarians can ‘‘practice’’ a surgical procedure before the actual surgery, and the ability to create patient-specific surgical guides that improve accuracy and reduce surgery time. 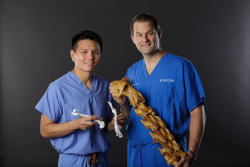 This is important, he said, because he and UF small animal surgeons, including Stanley Kim, B.V.Sc., an associate professor of small animal surgery who sought out a collaboration with the Biedrzycki lab and subsequently operated on Chance, wanted bone models that “actually feel and handle like the real thing” during presurgery practice. Although 3-D technology is being used in surgeries at a handful of veterinary teaching hospitals in the United States, UF’s printing capabilities are unique for several reasons. The printer and the materials it uses are high quality, being located at the college allows for a quick turnaround time, and the software allows surgeries to be planned out on a computer ahead of time. The process begins with the inputting of diagnostic CT scans into specialized software the veterinarians use to plan a specific surgical procedure. Then, a model of the patient’s bone is printed, to which a customized 3-D printed surgical guide is attached. He said the printer’s primary usefulness clinically is the ability to create these customized printed guides. Biedrzycki has only used the technology clinically on Bebop, the pot-bellied pig, who had a chronic shoulder luxation that required a complicated surgery to correct. Biedrzycki is investigating the technology’s potential for surgery on horse hooves. He also is excited about the potential use of 3-D printing in teaching and research. Kristin Campbell of Port St. Lucie, Bebop’s owner, said the 2-year-old pig is doing well and that his recovery exceeded their expectations. As for Chance, life has taken a huge turn for the better thanks to the Greater Swiss Mountain Dog Rescue Foundation, which facilitated his transport to UF — and the procedure Kim conducted to help him. A veterinarian in Canada diagnosed the dog with a bilateral patellar luxation due to limb deformities, with the right hind leg being the most severely affected. Aware of the 3-D technology, the veterinarian believed it could help Chance, although he felt the prognosis was guarded at best, Saxon said. During his recuperation period, Chance received water treadmill therapy in Sarasota and has continued to recuperate well. Although he may still need surgery on his other leg, Saxon plans to see how Chance does over the summer. “We are so happy to see him be able to walk, run and play more normally,” she said. The University of Florida College of Veterinary Medicine is supported through funding from UF Health and the UF Institute of Food and Agricultural Sciences.